The New Engineering Contract (NEC) is one of the leading standard forms of contract for major construction and infrastructure projects. The latest edition of the contract (NEC4) is now a suite of contracts widely used in the UK, Australia, Hong Kong, South Africa, Ireland, and New Zealand. 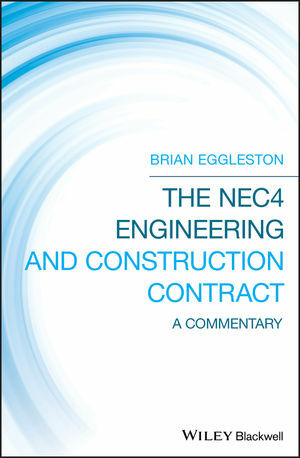 This timely and important book provides a detailed commentary on the latest edition of the main NEC4 Engineering and Construction Contract (NEC4 ECC) form. It explains how the contract is intended to operate and examines each clause to consider its application and legal interpretation. It also draws upon the author's highly successful third edition of the book covering the previous contract. It identifies and comments on the changes between the current and previous version of the form. After a brief introduction to the new edition of the form, The NEC4 Engineering and Construction Contract offers in-depth chapters covering everything from main options and secondary option clauses to risk assurances and NEC 4 family contracts. In between, readers will learn about general core clauses, the obligations and responsibilities of the contractor, testing and defects, payments, compensation events, and much more. The NEC4 Engineering and Construction Contract: A Commentary is an excellent book for construction industry professionals working for clients, employers, main contractors, project managers, subcontractors, and specialist contractors. BRIAN EGGLESTON CEng, FICE, FIStructE, FCIArb, was a chartered arbitrator with extensive UK and international experience and was past President of the Chartered Institute of Arbitrators. He acted as an adjudicator and mediator, as an adviser to contractors and employers on contractual matters and was a well-known author and speaker on contract law and standard forms. In a career spanning over 40 years he worked on all sides of the construction industry, firstly as a bridge designer, then as a resident engineer and contracts administrator, and subsequently as a director of various building and civil engineering contracting companies.